David Dunckley, a 71 year old retired journalist, who has lived in the village for the past 38 years, says he is incensed at the damage caused to a grass verge in Kenilworth Road where 60 of the flowers were pulled up and trampled into the pavement and gutter last Thursday by youngsters. Mr Dunckley, stated he was going for a morning stroll when he spotted the damage on March 19 between the Co-op store and the White Horse pub, which is close to the school premises in Gipsy Lane. He says schoolchildren caused the act of vandalism and that it is unacceptable. “This wanton damage has been going on for several days, particularly since the flowers bloomed and can best be seen after the children have gone to school in the morning and again after they have wended their way home into the late afternoon,” he said. Mr Dunckley says he has contacted Heart of England School and was told pupils have been warned they will undergo detention if they are are caught taking part in such acts. 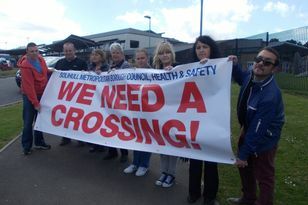 He has also been in touch with the Mayor of Solihull, Councillor David Bell, (Con, Meriden). A NOMADIC football club has a home of its own at last - and borough Mayor Councillor David Bell was on hand to officially open its new ground. TAKE care - and don’t be fooled by the apparent weather conditions, that’s the message from emergency services after a spate of crashes in and around Solihull this week.